This packet sows up to 8 feet. 'Cabernet's' globe shape and burgundy skin make it a picturesque addition to your harvest! Enjoy the sweet flavor raw on salads or burgers, or cooked into a jam on toast or cheese. Bred for 2"–3" uniform shape and early harvest, this onion will store for up to 6 months! Recipe for red onion jam inside packet. Intermediate-day onions grow best in latitudes 32–42. Variety Information: Uniform, 2"–3" round bulbs with dark red rings. 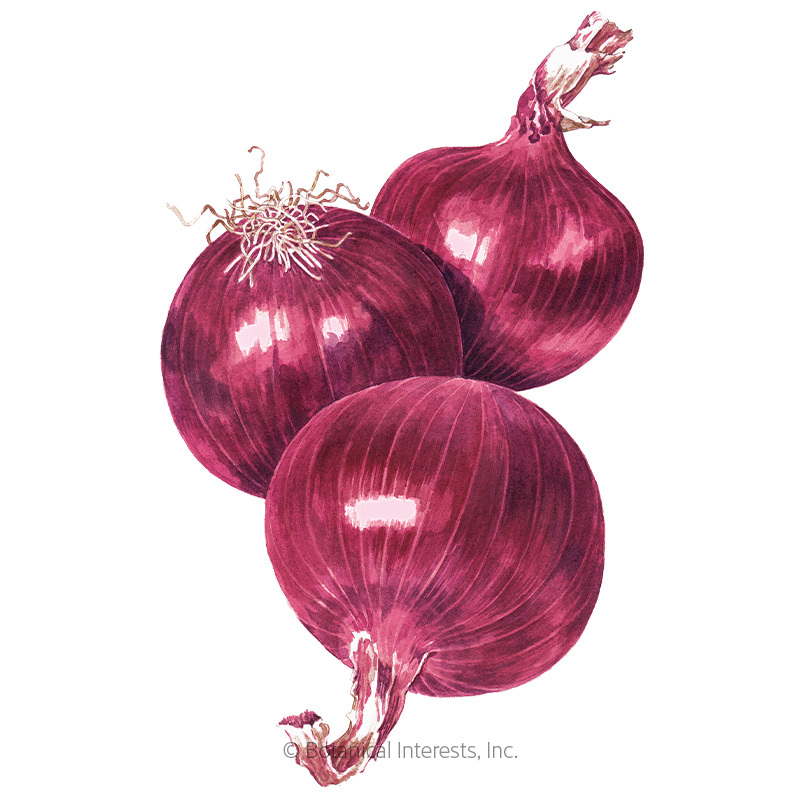 'Cabernet' is an intermediate-day onion with a 4- to 6-month storage life. When to Sow Outside: 4 to 6 weeks before your average last frost date, or as soon as soil can be worked; when soil temperature is at least 45°F. When to Start Inside: RECOMMENDED. 10 to 12 weeks before your average last frost date. Transplant outdoors 4 to 6 weeks before your average last frost date. The earlier the start, the bigger the bulb. Ideal soil temperature is 60°–85°F. Seed Spacing: A group of 2 seeds every 4"
Thinning: When 2" tall, thin to 1 every 4"
Harvesting: When onion tops have fallen over and turned yellow or brown, they are ready for harvest. Harvest in the morning, lifting onions with a garden fork. Dry them in the garden in the sun for 2 to 3 days, lightly covering the bulbs with straw, or the tops of other onions to prevent sunscald. Cure onions for 3 to 7 days in a dry area with good air circulation. Once dry, cut the roots to 1/4", and the greens to 1" to create a seal, preventing decay.